A regular addition of CCLS "the Original" bacteria septic tank additive. CCLS is USDA approved, and has been used in households like yours since 1976. Carl's Septic Service, Inc. recommends CCLS to all of my residential customers. Why? . . . Because it Works! The bacteria present produce enzymes that break down organic solid material into food for the bacteria. The bacteria digest this material and use the food to multiply and produce enzymes. This cycle continues until the waste has been completely digested, leaving the area free of solids, free-flowing, and odor free. What are the Advantages of Using CCLS? CCLS is formulated from naturally occurring organisms. It is non-toxic, non-hazardous, non-corrosive, non-combustible. It emits no odors or harmful fumes. It will not harm the skin. It will not harm humans or pets, although not intended for human consumption. CCLS contains no acids, caustics, chloride, or volatile organic compounds. CCLS is biodegradable, is safe for the environment, and is completely safe to store and use in the home when used according to directions. There are literally hundreds of products being sold as septic system additives. Some are good and some are not so good. Why is CCLS the best? 3. CCLS is part of the best customer education program in the business. CCLS is also effective on controlling pet odors, garbage bins,diaper pails, and other areas of organic odors. Just dab CCLS full-strength or spray on affected areas. More information about CCLS can be found by visiting Cape Cod Biochemical Company. Start treating your septic tank today! 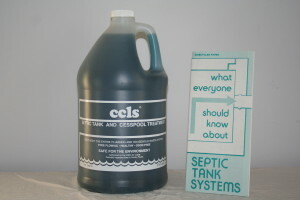 Contact Carl's Septic Service, Inc. to place your order of CCLS Septic Tank Additive. Septic Tank Additives and Treatments.